Dining out in any city can be confusing, let alone in London. It can be difficult to know where the best places are; are you getting a great meal for the price? Will you be underdressed or overdressed for a particular restaurant? While it’s fun to try small local restaurants while out in the rural countryside, it can be tempting to eat at the ample comfortable options in the city, like fast food restaurants. However, if you’re taking the time and spending the money to travel, it’s never a bad idea to get a taste of local cuisines or spend one evening as a date night at a Michelin starred restaurant. London is a great place to do just that. The city is enormous and filled with a variety of award-winning restaurants you won’t want to pass up. We’ve assembled a variety of some of the most high-class restaurants around London, with menus that vary from traditional British cuisines to French and even American fare. London is even home to the only Chinese restaurant to earn a Michelin star, as well as to Gordon Ramsay’s flagship restaurant. Each experience is unique and incredible. Dine 28 stories up above the city and enjoy the view, or dine tucked into a dimly lit, private booth for a romantic meal. The choice is yours. You’ll definitely have a hard time choosing where to dine during your stay in London! This 3 Michelin star restaurant is run by Alain Ducasse, the most successful restauranteur in the world. This restaurant is his first in London and has earned him 3 of his 15 Michelin stars. This location is a hyper-modern 80 seat dining room with a distinctly French menu. The menu is dedicated to craftsmanship and combines new and old techniques. While this is one of the most expensive restaurants in London at more than £100 per head, it’s an experience you can’t afford to miss. Galvin At Windows is a restaurant located on the Hilton’s 28th floor and offers stunning views of the cityscape. Galvin also serves French cuisine in a simple, yet attractive style. Prices at Galvin At Windows reflect both the delicious food and the fantastic views. If you book a table at Galvin At Windows, take care which you pick; some of the tables in the middle of the dining room have poor views. The two-Michelin-starred Hibiscus recently moved from Ludlow to Mayfair, bringing its winning formula with it. The restaurant focuses on Welsh ingredients, including lamb’s brain, Shropshire rose veal, and choux farci. The London branch of ‘Atelier’ restaurants by Joel Robuchon has no bookings and offers some of the finest food in the world. The two-Michelin-star restaurant aims for simple foods, but the atmosphere of the dining area’s decor is incredible, featuring sweeping foliage and a central kitchen. If you sit at the bar, you can watch your food being prepared. This steak and seafood restaurant may have a limited, set menu of USDA prime beef and Norwegian King Crab, but what it does do has critics raving. The large dining room resembles a Viking feasting hall, with enormous oaken tables and dancing candlelight. Beast is a restaurant that targets big spenders, but its use of incredible ingredients that are perfectly and painstakingly prepared makes it one you won’t want to miss. Just make sure to come hungry. The portions are enormous! This 1-Michelin star restaurant opened in February 2011 and is located on the ground floor of the Mandarin Oriental Hyde Park hotel in Knightsbridge. The restaurant offers a new-historical take on British recipes, and the menu includes offerings like Hay Smoked Mackerel, Meat Fruit, and Rice & Flesh. The menu changes seasonally four times a year, but diners will always get refined British brasserie cooking. The uniquely named Aqua Shard serves British and Modern European cuisines. Located on the 31st floor, the bar is located in a two-story atrium with immense windows and lots of natural light. Meanwhile, the dining room is filled with crushed velvet and deep booths that provide diners with plenty of privacy. Try appetizers like hand cut rose country beef or steak tartare, or main dishes like pork belly with buckwheat pancake, fruit chutney, black pudding, and tomato. Hakkasan boasts the first Michelin star ever awarded to a Chinese restaurant, and is one of the best of its kind in London. The cuisine dips away from Western variations on Chinese staples, and the result is both modern and mouth-watering. While the exterior of the restaurant is somewhat unimpressive, but don’t let that stop you from enjoying the dining room’s icy blue lighting and privacy created by screens. While this will probably be the most expensive Chinese you’ve ever eaten, it’s definitely worth it. This elegant restaurant serves meat and game animals. The focal point is the imported Argentinean parilla charcoal grill in the center of the room. Diners can enjoy succulent beef from Scotland, Australia, and the United States, as well as truffled lobster mac and cheese or crispy lamb sweetbreads. 34 is a prime location for any meal, not just dinner, with hefty options for breakfast and lunch as well. This restaurant has two coveted Michelin stars. The interior is smooth curves and gleaming mirrors, while the menu is contemporary French. For those looking for lighter fare, Pied à Terre’s cuisine is lighter on the stomach and easier on the arteries than traditional French fare, while not sacrificing even an ounce of flavor. Due to Ramsay’s celebrity, it’s really quite difficult to get a table at this small restaurant. However, if you can manage to secure a table, you’ll be treated to an incredible British restaurant with seasonal offerings. Restaurant Gordon Ramsay is the only restaurant run by a British chef to have received three Michelin stars, and you can certainly see and taste why. 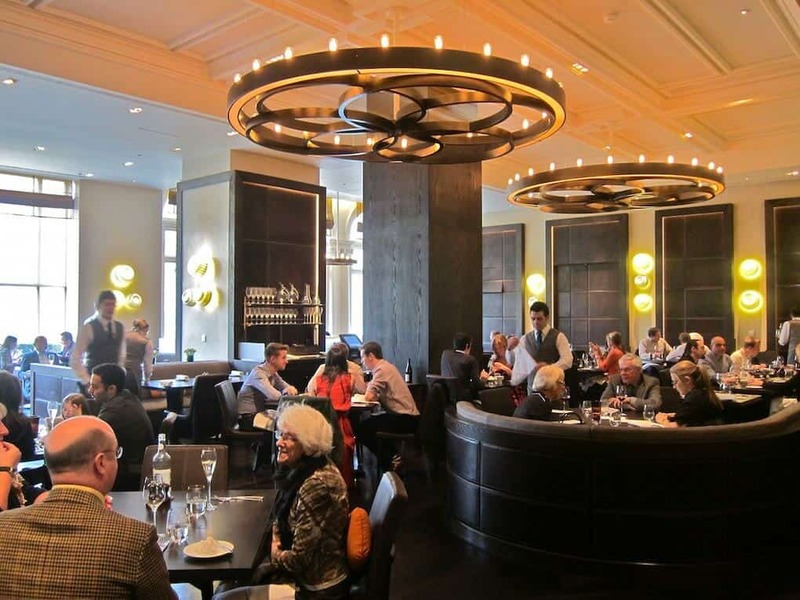 This is another expensive but brilliant London restaurant run by super chef Marcus Wareing. The restaurant used to be Petrus under Gordon Ramsay, but has found new life. The décor has changed little from its days as Petrus–and the glamor of the restaurant is exuded by both the decorations and the menu.